Sober Recovery is the worlds largest directory of addiction treatment centers. Recovery Marketing Group was engaged in 2007 to take over search engine optimization and site structure changes. Our firm added over 1,000 pages of search optimized content, redeployed the existing 200,000 pages of content and added multiple features to the site. This resulted in a ten fold increase in traffic from 45,000 unique visitors per month to over 500,000! In 2009, RMG was engaged to take over all aspects of management and marketing of the site focusing on customer satisfaction resulting in doubling revenue. Sober Recovery maintained over 1,400 first page positions in Google, Bing and Yahoo from 2009 to 2011. 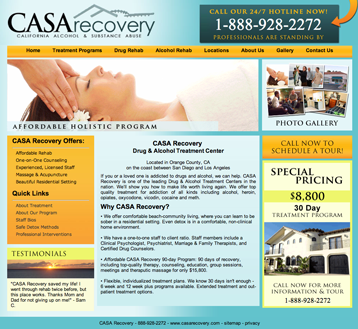 Casa Recovery was founded in 2010 and engaged Recovery Marketing Group to launch their online presence.